The Reuven Ramaty High-Energy Solar Spectroscopic Imager (RHESSI) (Lin et al. 2002) has been making high quality solar flare X-ray and gamma-ray measurements since February 2002. It covers the energy range from 3 keV – 17 MeV with a resolution of ~1 keV FWHM from 3 – 100 keV. The Miniature X-ray Solar Spectrometer (MinXSS – X123) CubeSat complements the RHESSI spectroscopy observations by extending the energy range down to below 1 keV with improved energy resolution of ~0.24 keV FWHM up to energies as high as 12 keV for the largest flares. Figure 1 (Figure 15 of Moore et al. ) 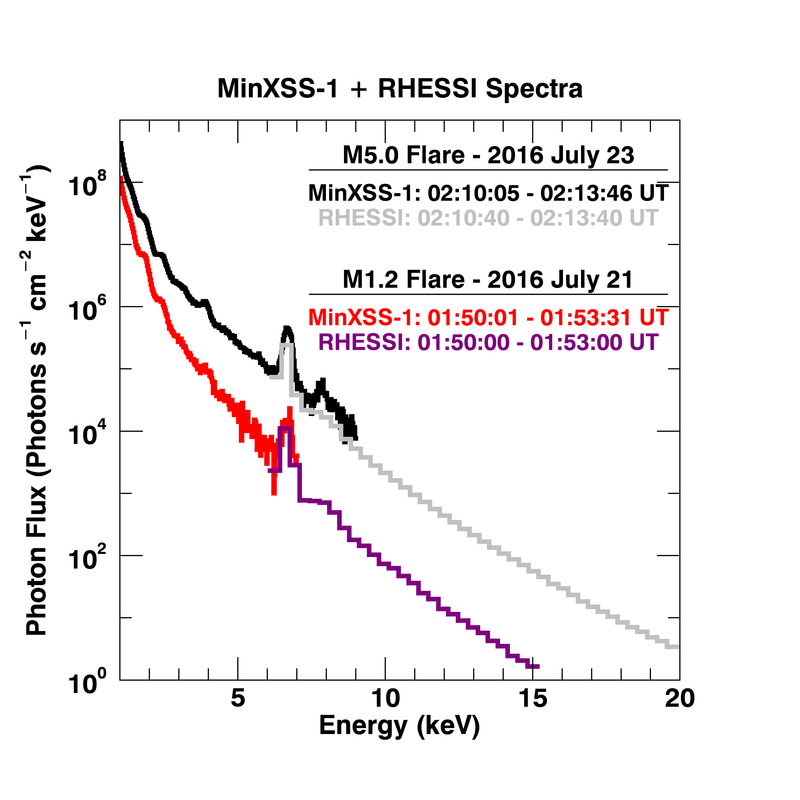 demonstrates the complementary nature of the MinXSS and RHESSI X-ray spectral measurements for two flares in July 2016, the Geostationary Operational Environmental Satellite (GOES) M5.0 flare on July 23 and the M1.2 flare on July 21. The MinXSS observations cover the energy range from 1 to 7 keV for the M1.2 flare and 1 to 9 keV for the more intense M5.0 flare. The RHESSI observations for both flares are restricted to energies above 6 keV by the insertion of the thin aluminum attenuators in front of the germanium detectors during the flares to limit the effects of the high count rates. The upper energies of ~15 keV for the M1.2 flare and 20 keV for the M5 flare are set by the RHESSI background count rates. The consistency in the spectral shape between the RHESSI and MinXSS simultaneous observations affirms the quality of the MinXSS data. The MinXSS extension of the spectral measurements to lower energies and with higher resolution than RHESSI opens new parameter space and context for understanding solar flares. MinXSS spectra can be used to infer plasma temperatures, emission measures, thermal energy, and elemental abundances during flares (abundances are discussed more in the MinXSS Science Nugget 007). RHESSI provides both spatial and spectral information on the non-thermal accelerated electron energy flux, in addition to complementary information on the thermal flare plasma. Cross-calibration between the two instruments will be conducted in the near future to quantify and understand any differences in the spectra. Future temporal analysis using the electron beam thick-target model, will map the non-thermal accelerated electron distribution during the flare impulsive phase (deduced by RHESSI) and the thermal evolution and abundance variations during all phases of the flare (inferred by both MinXSS and RHESSI).